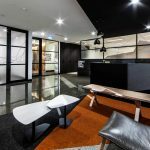 IA Design work alongside Frasers Property to produce a first of its kind, 6 star Green Star rated environmentally sustainable workplace for their Perth office. The project focused on two core elements. The first being the transition from a cellular and divided workplace to a flexible, open and collaborative working environment. The second, the creation of a workplace committed to sustainability beyond formal certification. 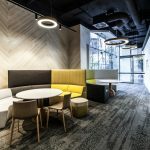 In collaboration with Frasers Property, the IA Design team took an innovative approach to sustainable design including items such as an electric car charging bay and sensor controlled window treatments to minimise heat gain and optimising natural light transmission into the floor plate. In addition, all furniture, equipment and materials used in the fitout were sustainably produced and certified. To support staff wellbeing, green walls were installed and the facade of the building was punctured to allow additional access to outside air, both achieving improved air quality. All workstations featured sit-to-stand mobility to improve ergonomics. The entire project team showed great dedication and contributed significant effort to provide the specifications, documentation and attention to detail required to achieve a 6 Star Green Star GBCA classification. At time of completion, this was the only Perth fitout to achieve this classification. We are extremely proud to have received this recognition on behalf of our client Frasers Property.